﻿﻿﻿"Beyond The Pillars of Hercules"
That is where you will find Atlantis! (Plato). Myth, Legend or Fact – Atlantis reminds us that we are all part of the human race and that we should place great importance on imagination and continued hope. The name Atlantis is ancient Greek for “the island of Atlas” where we find the Titan and his bride Pleione striving to stay in contact with their daughters, the seven sisters of the Pleiades. The Space Shuttle Atlantis flew 33 missions traveling 126 million miles and has served as the original – keeping hope and imagination alive. 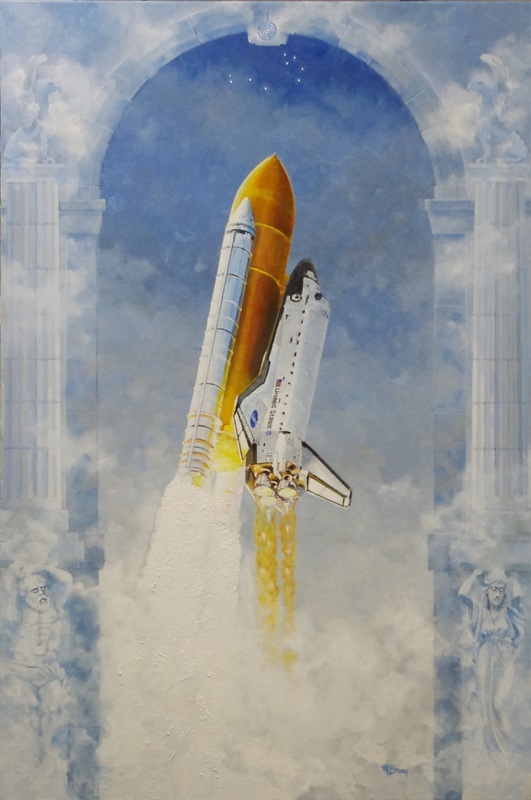 Awarded "1st Place Space Flight" at the 2015 American Society of Aviation Artists International Aerospace Art Exhibition and Forum held in Pooler, Ga. at the National Museum of The Mighty 8th Air Force. Original is available - please use the contact link above for more information.